In the 1901 census, the family was living in Warwick Street Chesterton, Staffordshire. Head of the household was James Venables, 26, a Mechanic (A), who had been born in Birmingham. His wife Mary Jane, 26, a Distillerr of ( word Bergol ??) had been born in Wrexham,Denbighshire. Their son John, 3 had been born in Wrexham as had Arthur, 1. Brother-in-Law, David Leech, 25 an Engine Tender, Stationary was also present. The 1911 census shows the family living at Queens Avenue, Sandycroft, Nr. Chester, Flintshire. James Venables, 37 was a Foreman at the Tar Works (Tar Distillers). His wife of 15 years, Mary Jane was 37. Six children had been born to them, but 1 had died. The listed children were John, 13, Albert Edwin 11, James Ernest 9, Gwendline 7, Reginald was 1. There was a Boarder, Samuel Leake, 27 a Sulphite Ammonia Stillman at the Tar Works. Great Britain, Royal Naval Division Casualties of The Great War, 1914-1924 accessible on www.ancestry.co.uk confirms John’s military service details above and tells us that his cause of Death was that he died of wounds in 3rd Canadian Stationary Hospital Doullens He had received Gun Shot Wounds to his left arm on the 27th March 1918. His Service history states that he was in the Army Reserve from 21st January 1916, and entered on the 13th August 1917. He was drafted for the British Expeditionary Force on the 4th February 1918 and posted to the Anson Battalion on the 19th February 1918. It also tells us that he was born on the 20th January 1898 and gives his father James Venables, of Chemistry Works, Queensferry as his next of kin. UK, Royal Navy and Royal Marine War Graves Roll, 1914-1919 accessible on www.ancestry.co.uk about John Venables confirms his military details, this gives his death as the 28th March 1918 and that he was killed or died as a direct result of enemy action. It details the location of his grave as above. This source tells us that he was born on the 20th January 1898 in Brymbo. UK Naval Medal Award Rolls 1793 -1972 also on ‘Ancestry’ details his medals. 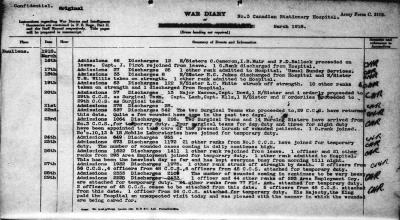 (From http://data2.collectionscanada.ca/e/e061/e001512190.jpg ) this gives a page of the War Diary. 2 Officers from 56 C.C.S., 4 Officers from 48 C.C.S., 6 Officers from 46 C.C.S. attached for temporary duty. The next day the 28th March 1918 records that the number of wounded coming in continue to be very heavy. On the 29th March 1918 His Majesty the King paid the Hospital an unexpected visit today and was pleased with the manner in which the wounded are being cared for. John Venables is also remembered on the Queensferry Chemical Works Roll Of Honour that is in the Hawarden Record Office, it is a list in a Frame.